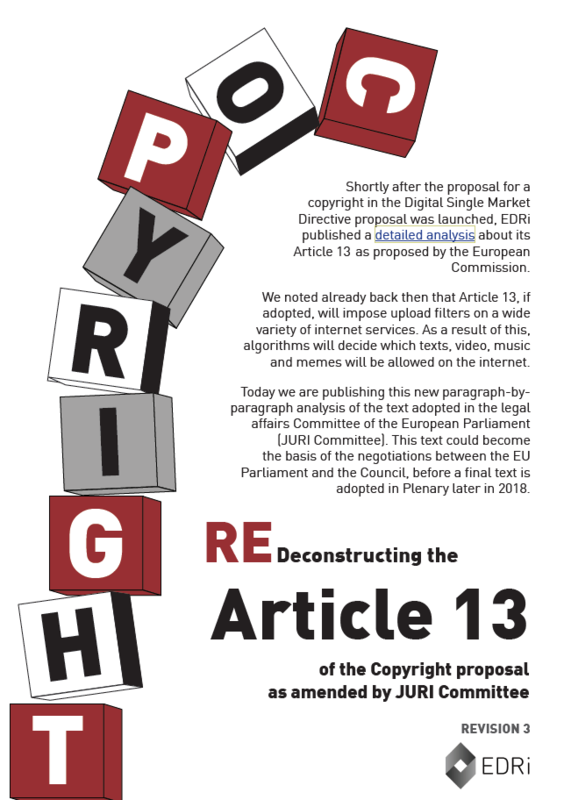 This week we have published a new analysis of the proposal for upload filters in the Copyright Directive proposal. The paper is a new paragraph-by-paragraph analysis of relevant parts in the text adopted by the Legal Affairs Committee of the European Parliament (JURI Committee). The work complements our first analysis of the initial proposal by the Commission. In our new analysis you will be able to read the relevant adopted texts by JURI, on the left, and our explanation of what these paragraphs mean in practice on the right. The necessity of our new detailed analysis lies in the recent misunderstandings about what the text means and what it doesn’t mean. This text could become the basis of the negotiations between the EU Parliament and the Council. MEPs will decide whether the Copyright Directive is built on closed-door negotiations or an open, democratic debate during the 5th of July vote in the EU Parliament’s Plenary vote. Your action is crucial to keep an open internet which is free of upload filters. Act now: Ask you MEPs to attend and vote in your interest on the 5th of July! #SaveYourInternet!